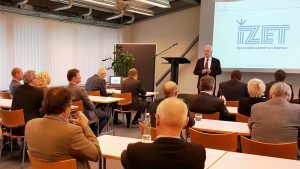 A desire for fresh synergies and exciting new project cooperations was the heart of the shareholders’ message at the recent kick-off event marking the start of the formal cooperation between Kiel University of Applied Science and IZET Innovation Centre on 22nd November 2016. The University became 1% shareholder in Gesellschaft für Technologieförderung Itzehoe mbH. 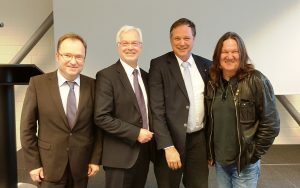 The main stakeholders – the City of Itzehoe and the Steinburg County – officially welcomed the University of Applied Sciences Kiel and above all its closer relationship with IZET and the associated strengthening of the East-West link between IZET / Steinburg region. The University of Applied Sciences has previously been present at IZET participating, for example, in in the Science Summer School or IZET’s open day. From the beginning of next year, the University of Applied Sciences will have a regular presence at IZET, offering support for entrepreneurs, students and the science and technology community in the region. Guests joined key-note speaker, Thomas Jensen, co-founder of Wacken Open Air, in his assertion that the active and efficient co-operation would be a great success.